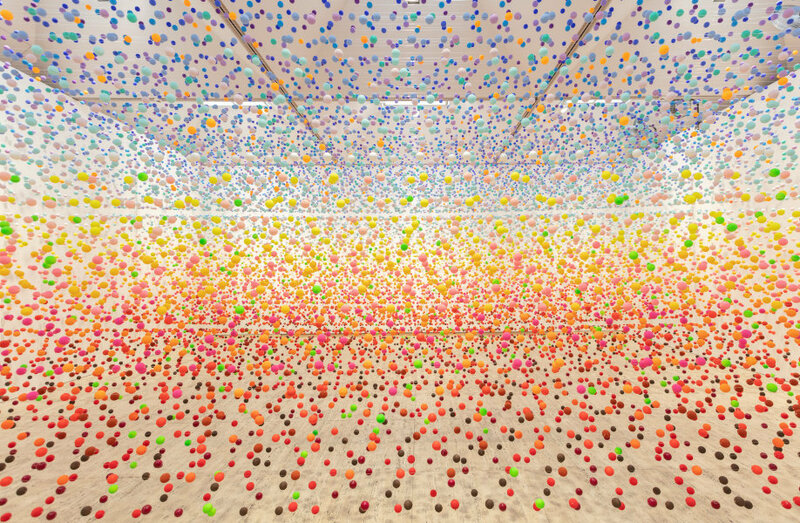 The room installation 'Atomic: full of love, full of wonder' is comprised of a shimmering haze of vibrating coloured balls, suggesting the very atoms that are the fundamental structural units of all things. 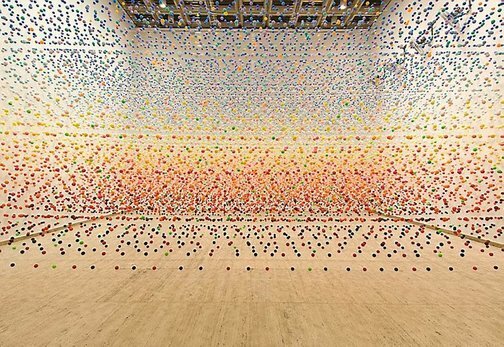 This mesmerising work has an extraordinary optical effect as the 1000s of suspended balls oscillate gently within a breeze created by large fans within the gallery space. It suggests a vastly expanded op art work from the 1960s, a form of late modernist abstraction in which the appearance of movement was achieved through carefully calibrated designs in paint on canvas or in sculptural and light works with components that moved or gave the appearance of moving. Also known as kinetic art, opticality - eyesight and its manipulation - became the subject of the work itself. Savvas was inspired in creating this work by the Australia landscape. More specifically, it was from remembering what was distinctive about the Australian landscape while living in grey, overcast, colourless London. Savvas recalled the red earth, shimmering heat haze, and bright blue skies of the outback and this was the inspiration for the colour groupings in this work which transforms the gallery exhibition space into a horizon line of coloured particles. This installation also suggests an utterly outsized version of the scientific models used in the classroom to teach molecular structures. The title 'Atomic: full of love, full of wonder' recalls the optimism of the utopian future that Atomic energy seemed to offer in the post-war period. 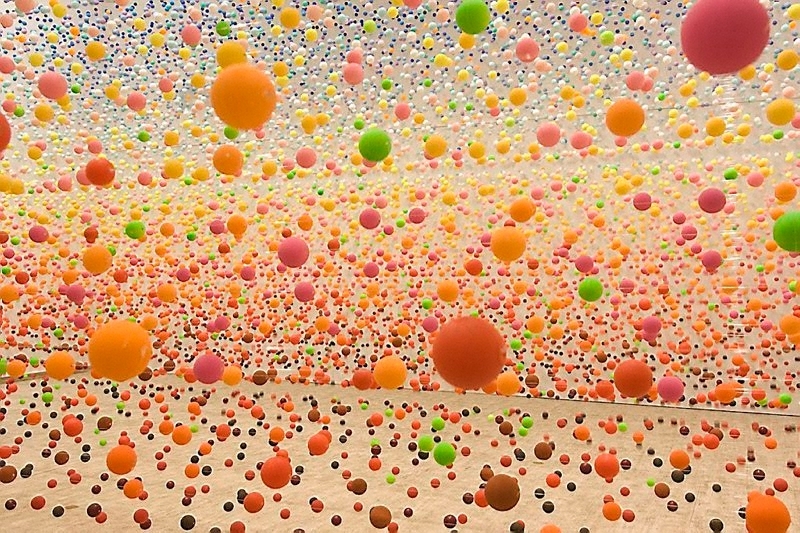 The fact that it generated the fear that the world may be destroyed and was one of the fundamental causes of cold war anxiety seems to be far away from this gently moving immersive field of colour which provokes pleasure and wonder. 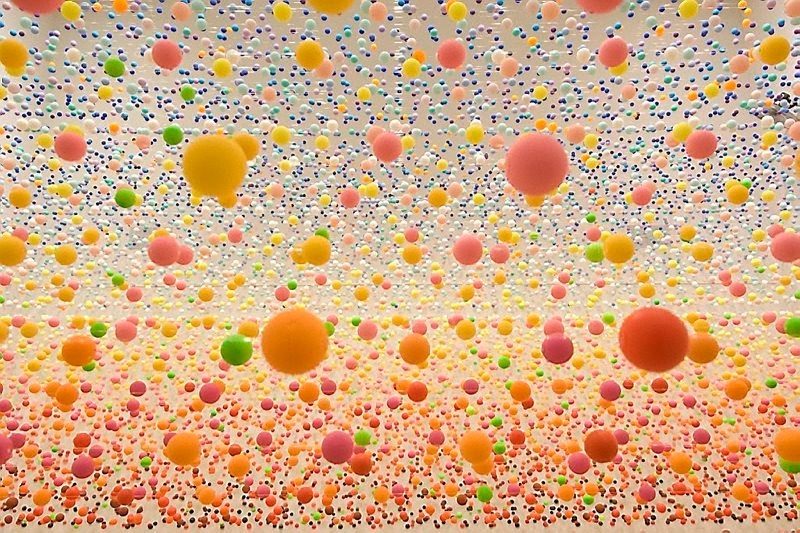 Rachel Kent, Nike Savvas: full of love, full of wonder , ‘Colour magic: the art of Nike Savvas’, pg. 9-57, London, 2012, cover (colour illus. detail), 49, 58-59 (colour illus. ), 60-61 (colour illus. detail), 62-63 (colour illus. detail), 64-65 (colour illus. detail), 66-67 (colour illus. detail), 68-69 (colour illus. detail), 70-71 (colour illus. detail), 72-73 (colour illus. detail), 86, 122 (colour illus. detail), 123, 146, 158 (colour illus. detail), back cover (colour illus. detail). 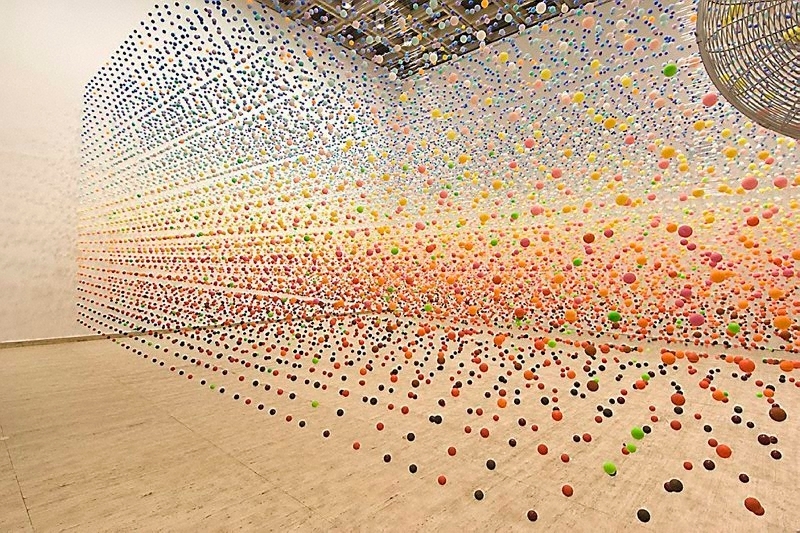 Daniel Palmer., Adventures with form in space: the 4th Balnaves Foundation Sculpture Project , 'Nike Savvas', Sydney, 2006, (colour illus.). Atomic: full of love, full of wonder , 2005, (colour illus. ).